You love the beach and island living and all that it has to offer? 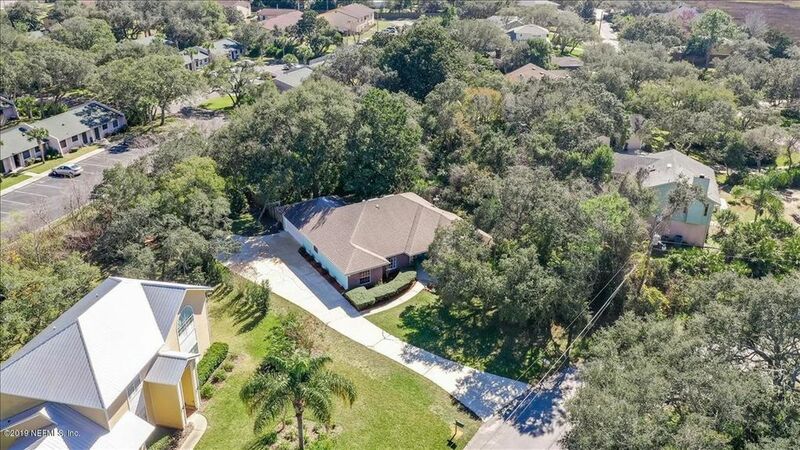 Anastasia Island, located outside city limits and an inviting neighborhood with no HOA or fees and is biking distance to the Amphitheater, and walking distance to the beach. The extended drive way, with a side entry garage, offers plenty of room for your water craft or RV. In a peaceful setting, this home is very private, nestled gently on a hill, with a canopy of mature oak trees and a natural surroundings preserve. Your private lot is .66 of an acre. This well cared for three bedroom, 2 bath home, features ultimate functionality, with split bedrooms, a spacious living area, with built in bookshelves, formal dining room, and breakfast area overlooking the natural preserve. Easy care ceramic tile floors in the main areas and carpet in 3rd bedroom, Galley kitchen features custom cabinets, with an old beach flair, and natural light from the skylight. This is truly a rare beach, island home waiting for you to move in. Directions: Coming off 312 onto Anastasia Island, turn left, shortly after that turn left onto San Rafael St and then another left onto San Rafael Ct. House is on your left.